After many years of extensive research, Dr. Jhonny Salomon Plastic Surgery and Med Spa introduced the Éclat Product Line. The most advanced skin care system available, its pharmaceutical grade ingredients are scientifically proven to support and stimulate healthy function of the skin, targets uneven skin tone, hyper-pigmentation, age spots, fine lines and wrinkles, enlarged pores, acne, and environmental damage. Combining the best in prescription ingredients with powerful, all natural, botanical ingredients, Éclat is the best of both worlds! While gently removing impurities, oil, and makeup, this mild gel-based cleanser prepares and conditions skin to optimize the penetration of the system and enhance your skin’s clarity. Formulated with a soothing Aloe Vera base and scented with grapefruit essential oil, Éclat Clarifying Cleanser contains the antioxidant and calming powers of Green Tea, Azelaic Acid, Willow Bark, Sugarcane, and Lemon. enlarged pores, infusing the skin with a younger look. The Rejuvenating Serum’s unique formula provides for greater penetration to rejuvenate and enrich skin not only on the surface level, but on the cellular level as well. There are 3 different types of rejuvenating serums. Depending on your skin type and specifics, one will be chosen to best suit you. This prescription chemical exfoliant is used to treat environmental damage, reduce the appearance of fine lines, wrinkles, and enlarged pores, and slow the aging process. Tretinoin works by accelerating cell turnover which, in turn, rids your the skin of unwanted dead skin cells, revealing new healthy skin for a firmer, more even- toned, radiant look. As if Tretinoin alone was not already perfect, Éclat has taken it and infused into it Vitamin E and Vitamin C to soothe and further enrich the skin. 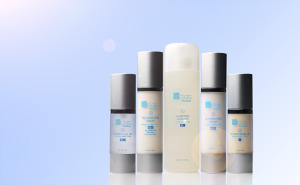 Éclat Tretinoin is to be used in conjunction with the Rejuvenating Serum. The Vitamin C Gel is a revolutionary antioxidant combination that delivers ultimate protection against free radicals, helps to rebuild collagen, and provides free radicals, helps to rebuild collagen and provides peerless antioxidant protection against photo-aging. This product corrects existing damage by stimulating essential proteins in the skin while aiding in cell turnover. Éclat Vitamin C Gel prevents future damage by arming your skin with powerful antioxidants and enzymes to combat threatening factors. The results are unparalleled: on the inside, a strengthened and healthy skin structure with improved defense against environmental damage, while on the outside a brighter, tighter, and more brilliant appearance for a look that years younger. The Illuminating Cream’s advanced corrective formula directly targets hyper-pigmentation, age spots, unwanted freckles, and scars at the skin’s surface and intracellular level. Combining Hydroquinone, a prescription strength ingredient deemed as the best topical constituent in reducing melanin production, with the scientifically proven lightening powers of natural Kojic Acid, Azelaiz Acid, and Licorice Root, this silky cream helps to visibly diminish the appearance of the skin’s damage while penetrating beneath the skin’s dermal layer to cease and prevent melanosome activity.